Wire Nine Review 2019: Is Wire Nine a Good Hosting? Founded in 2004, WireNine is an American web hosting provider that currently serves customers in over 70 countries. Over the years, they’ve garnered a lot of recognition in the web hosting industry for their speed, reliability, and high level of customer support. Founded in 2004, WireNine is an American web hosting provider that currently serves customers in over 70 countries. Their support team is entirely U.S.-based: they don’t outsource, and they’ve trained their personnel rigorously to provide expert technical help combined with a personal touch. For this reason, they’ve achieved much recognition over the years for their fast servers, reliability, and quality support in the realm of web hosting. WireNine features four main categories of services: SSD shared hosting, managed WordPress hosting, reseller hosting, and VPS hosting. Their shared hosting packages run on pure SSDs, LiteSpeed Web Server, and a CloudLinux OS installation, all of which combine to provide you with much faster loading and processing times than typical Apache shared servers. Your hosting resources will also be partitioned and thus protected from the effects of usage spikes from other users on the same server. With the help of R1soft, you’ll have the use of a fast and reliable backup system – should you ever accidentally delete or corrupt a file on your server, you can restore it from a copy that’s kept for up to 30 days. Each shared hosting account comes with cPanel, not to mention their one-click app installer with over 300 available scripts. I particularly liked the provision of a CDN on their shared servers; this explains why their service is popular in so many places other than North America. A CDN cuts down the distance between your website’s server and your visitors by storing cached versions of your website in multiple locations around the world. This means that even if your host is primarily based in the U.S. and you’re halfway around the world, your website won’t take a hit in either page loading times or search engine rankings. 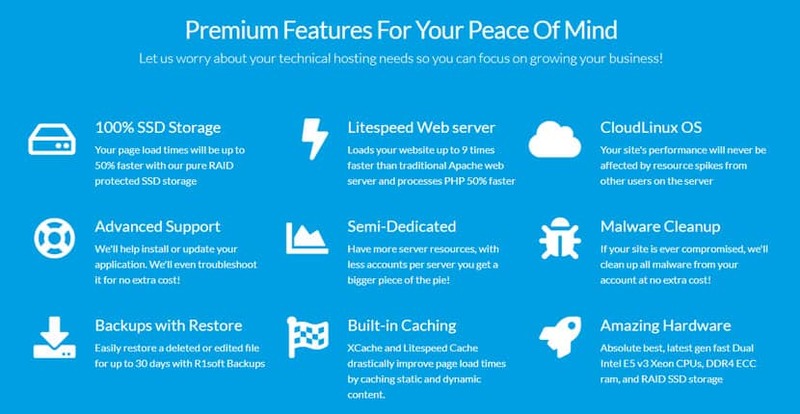 WireNine’s WordPress hosting plans are also noteworthy. They offer basically the same features as their range of shared hosting plans, but also include malware cleanups, DDoS protection, a WordPress website migration service, and WordPress staging functionality. As the most popular CMS in the market, WordPress is especially susceptible to hacking attempts, so malware cleanups and DDoS protection are imperative. WireNine’s prices are a little on the high side. This, in part, is due to the value-added features they load their plans with, not to mention the higher operating costs that a U.S.-based support team entails. The advantage is that you get much more competent support particularly if you’re sporting a WordPress installation and have WordPress-specific questions. You can opt to pay for your hosting packages either annually or monthly; with an annual payment term, you get a slight monthly discount and a free domain registration for the first year. If you’re based in the U.S. or Canada, you’re also eligible for $100 of Google AdWords credit with any package – though this requires you to first spend $25. WireNine has an industry-leading 60-day money back guarantee and a 100% risk-free trial of their services. Their goal is to hit a 100% customer satisfaction rate, so if at any time you feel like you’re not getting your money’s worth, you can ask them for a refund. WireNine’s commitment to quality support has enabled them to stand on equal footing – and in some cases even beat – their larger competitors. Not only are they fast in responding, but they’re highly competent and resolve technical issues much more efficiently than large hosting companies that seem to be mired in endless cost-cutting measures that come at the expense of the customer. You can contact their entirely U.S.-based support team via a 24/7 live chat, support tickets, email, or a U.S. telephone number. Their support representatives promise to respond to the live chat within a few minutes, though in my experience it’s always been less than a minute. In fact, they’re so committed to securing the loyalty of their customer base that if at any time you’re dissatisfied with their service, you can email their CEO personally with your concerns – the email address is posted directly on their website. With over a decade of experience in the industry, WireNine is no stranger to the market. It’s clear from their refined offerings and commitment to customer satisfaction that WireNine has fully developed a business model that can effectively serve their small to medium business clientele. Wondering how Wire Nine stacks up against other Web Hosting companies? Enter any other Web Hosting company and we will give you a side-by-side comparison.